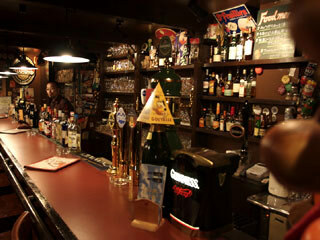 The Jha BAR is the one of the best beer bar in Japan, located Kanda, Tokyo. The Jha BAR has the all kinds of world beer including house beer and local beers of Japan. If you believe you know all beers of your country, visit here. They will still offer you the beer which you've never seen. You can actually enjoy drinking beer like Sushi, which means the bartender will serve you various kinds of beers, light, strong, dark, white, sweet, sour with their great choice of beers. They have also great food which really match with beer you ordered. The Jha BAR offers you the greatest choice of beers of all over the world. They have Draft beer, Belgian Beer, U.K & Irish beer, German beer, American Beer, and other beers. Of course Japanese local beers as well. Not just beers, they have standard Liqueur like Whisky, Gin or Vodka. The Jha BAR offers you well matched food for their beer. To make the beer taste even beer they have appetizers from all world. Especially, Fish and chips are the best choice because the biggest fish market are very nearby. One of the Jha BAR treasure is the labels of all kinds of beer they've served at the entrance. Kanda IPA is their Original House Beer.